Founded in Chicago in 1864 by George Washburn Lyon and Patrick J. Healy, Lyon & Healy built its first harp, Model 21 #501, in 1889. It was the sincere love of music and the enterprising nature of the young and ambitious Healy which drove the company to improve an instrument already thought to be perfect. It was Healy’s covenant which set the stage for decade after decade of groundbreaking innovation in engineering and craftsmanship. For 129 years, Lyon & Healy artisans have maintained Healy’s commitment to a practice of old-world craftsmanship while embracing new-world innovations. Today, Lyon & Healy strikes that balance daily as it pushes methods, materials and technology to better the instrument and better the craft—never falling back on routine or sacrificing quality for the sake of cost. 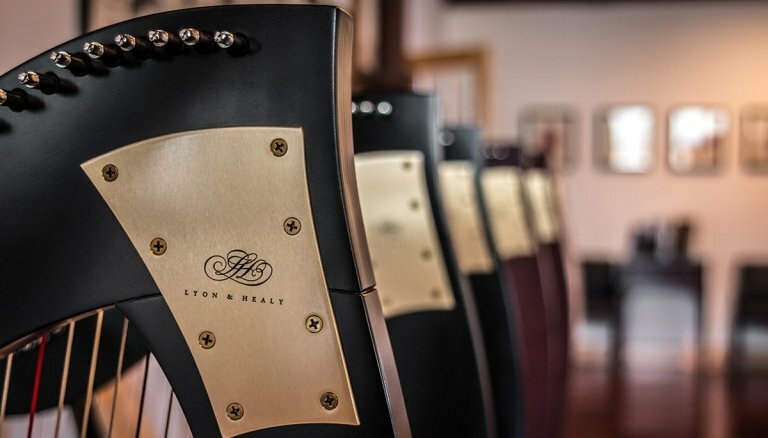 Use of the latest technology enables Lyon & Healy to refine parts of the instrument in greater detail and efficiency, while old-world craftsmanship ensures that care, precision and pride go into the building of each harp. This simple equation is Lyon & Healy’s best rationale for scrutinizing every detail when creating a harp. Each of the thousands of parts that go into making the instrument—from the wood in the base, soundboard, column and neck to the brass and steel parts in the pedal rods, action plates, spindles and discs—affects the harp in an aesthetic, musical and an engineering sense. To meet its own strict standards, Lyon & Healy either creates or customizes each of these parts itself. As a result, it maintains greater control and consistency in appearance, sound and craftsmanship in every harp it makes. The practice of Lyon & Healy’s meticulous sourcing of woods is highly-specific and highly-critical. Each supplier meets Lyon & Healy’s exacting specifications for woods worthy of use in its harps. The quality of each delivery of wood is scientifically tested to ensure that only the highest grade wood goes into each and every harp. The sorting process of the woods used for a Lyon & Healy harp begins in the Pacific Northwest and the Northern Midwest where suppliers select only mature growth of Sitka Spruce and Hard Maple for use in the soundboard and overall structure of the harps. The strength, resilience and rich resonance of Sitka Spruce make it the finest choice in wood used for the frame of the body and, most importantly, the soundboard of the harp. Sitka Spruce not only has one of the highest strength-to-weight ratios of any wood but also is responsive to the most subtle vibrations of sound. It has been used for centuries by the greatest instrument makers throughout the world. Lyon & Healy uses Hard Maple in the column, neck and body of its harps for its visual distinctiveness as well as for its structural vitality. Because the strings pull with up to 2,000 pounds of pressure, the harp’s structural foundation must be extremely strong. Hard Maple can endure that stress and has proven so since 1889. For just as long, instrument makers around the world have used Maple for its sheer beauty. The dimensional grains of Birdseye Maple and Curly Maple only further complement the lines, curves and individuality of every harp. As the woods arrive at Lyon & Healy, they are sorted, matched and archived according to color, density and shade so an exact resource is available as each harp is being made. The wood then goes through several drying stages in climate-controlled rooms to eliminate moisture that affects sound and causes warping. The entire drying process, necessary to creating the finest harp, can take from six months to a year. Seven layers of stainless steel linkage and more than 1,500 parts comprise the action of a Lyon & Healy concert grand harp. Custom milled and painstakingly adjusted, every piece of the action—from the pedal rods to the spindles—undergoes rigorous testing to ensure that when put into place, every part interacts smoothly, silently and accurately with the others. Durable metals resistant to deterioration protect the parts from corrosion, which can affect the reliability and longevity of the harp as well as the quietness of the action. Gold plating on the brass discs confirms that, in every sense, Lyon & Healy spares no expense in the creation of an unparalleled mechanism. The benchmark of Lyon & Healy’s success is the craftsmanship and skill of the people who build the harps. This craftsmanship goes into both the wood-working for the harp and metalworking for the mechanism. Lyon & Healy is proud that assembly line methods have never been the way of creating a Lyon & Healy harp. By doing the metal working in-house, artisans can greater customize each harp and not have to adapt the harp to fit available parts. Continuing the art of hand-carving every intricate detail into the wood allows Lyon & Healy to preserve a standard for excellence in harpmaking that can be achieved in no other way. 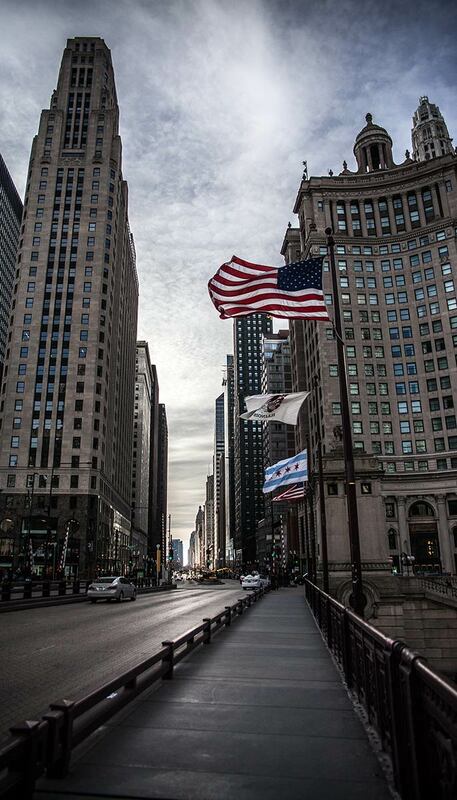 A highly skilled workforce embodies Lyon & Healy’s strong commitment to the craft. Through an internal apprenticeship program, each member passes along knowledge acquired during years of harpmaking. This system of apprenticeship is used at every stage of building a harp—from selecting and gluing the wood to shaping and building the body, from hand-carving the column to building the action and applying the gold leaf. Each stage is a training ground where the apprentice can spend three years learning just one area of harpmaking—it can take ten years to become a master craftsperson. 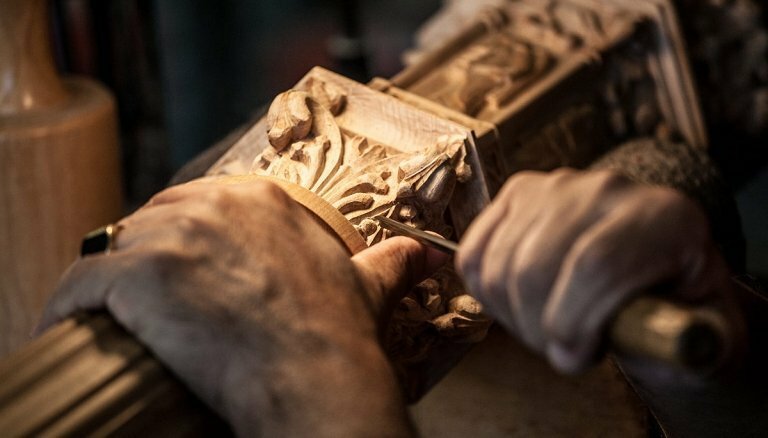 Through these years of close work together, master craftspeople instill in their apprentices a sense of pride in their art and a demand for excellence. As the Lyon & Healy family grows and matures through this tradition passed down through generations of masters, a singleness of purpose perseveres—so, too, does the appreciation for instrument and craft that is passed on from harpmaker to harpist. Although the meticulous scrutiny Lyon & Healy puts into choosing the wood, creating the mechanism and preserving the craft ensures that the sound of each harp will be flawless in every sense; every harp is still put through rigorous testing for quality of sound after it is built. 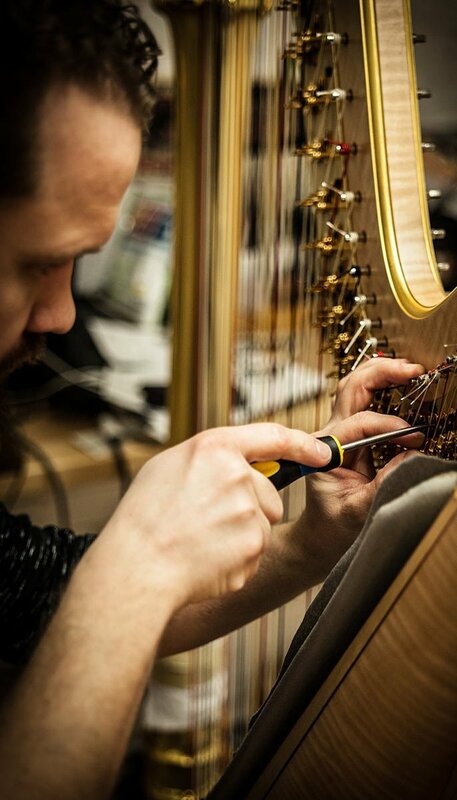 Each harp created by Lyon & Healy first undergoes careful tuning procedures by qualified harp technicians before it is repeatedly performed upon by a professional harpist who listens to the sound. What is the harpist listening for? The sound unique to Lyon & Healy harps. This sound is marked by its resonance, clarity and carrying ability. This unparalleled Lyon & Healy sound is recognized around the world in concert halls, music schools and private homes as the professional choice. Since it made its first harp in 1889, Lyon & Healy has demonstrated a consistent commitment to the harp community through the services it provides, events it sponsors, accessories it offers and, most of all, the relationships it fosters. Because a harp is created for a lifetime of use, harpists depend on the people who made the instrument for a lifetime of commitment. Harpists not only have confidence that the staff and management at Lyon & Healy are the most experienced resource available to them for questions or concerns but also have confidence in knowing their harp comes with a standard warranty. The Lyon & Healy Music Department archives a comprehensive collection of more than 2,000 harp music publications. Along with music, harpists are put in touch with unique harp-related merchandise – from strings to stationary to trunks – at www.harp.com. Event participation and sponsorship is Lyon & Healy’s way of fostering long-term relationships with harpists both nationally and internationally. 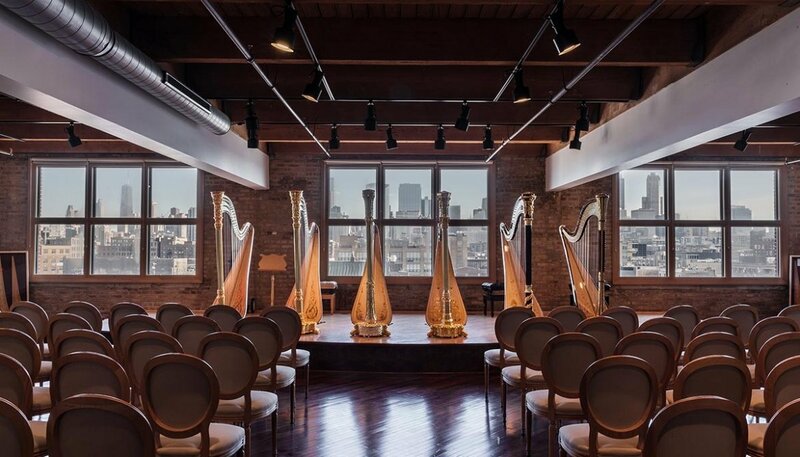 To support competition and the launching of careers, Lyon & Healy has provided a gold concert grand harp as first prize at the USA International Harp Competition and the International Harp Contest in Israel for many years, and has recently introduced the Lyon & Healy Awards, to be held around the world. 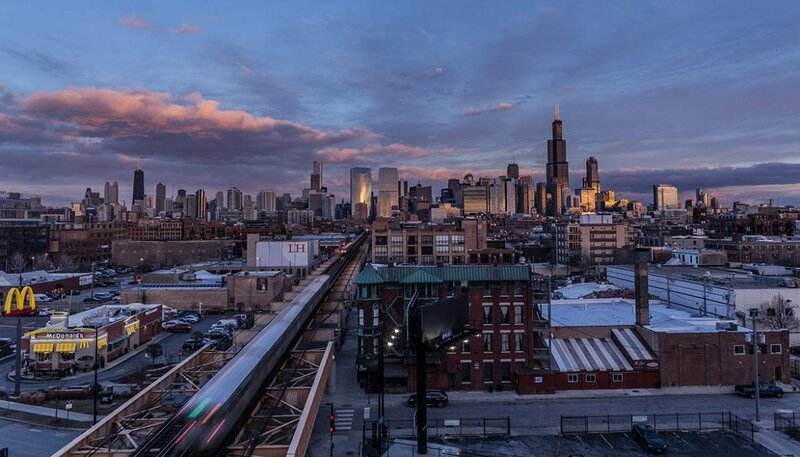 The magnificent Lyon & Healy harps are brought to life for the world to enjoy at its factory in the West Loop area of Chicago. Located on the top floor of the plus-75-year-old brick building is Lyon & Healy Hall, which provides the final link between harpmakers, performing artists, composers and rapt listeners. Lyon & Healy Hall celebrated its opening season in April 2005 with a concert by acclaimed harpists Sarah Bullen, Principal Harpist of the Chicago Symphony Orchestra. 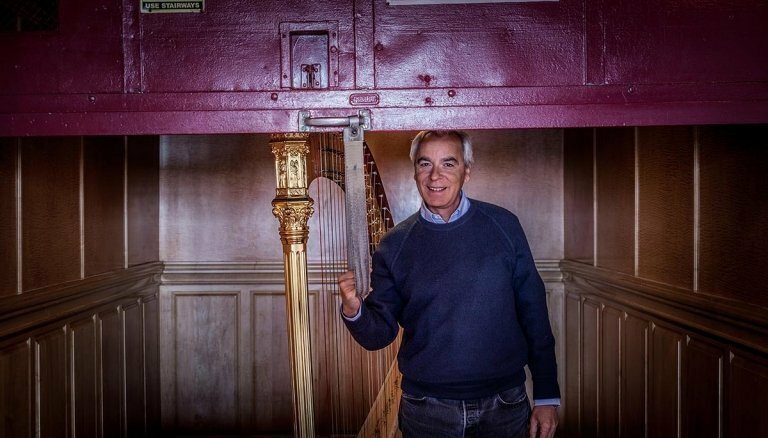 Lyon & Healy’s commitment to the harp community is also built upon the quality of repair and refurbishing it handles for clients all over the world—from minor fixes to major repairs and even total restoration. 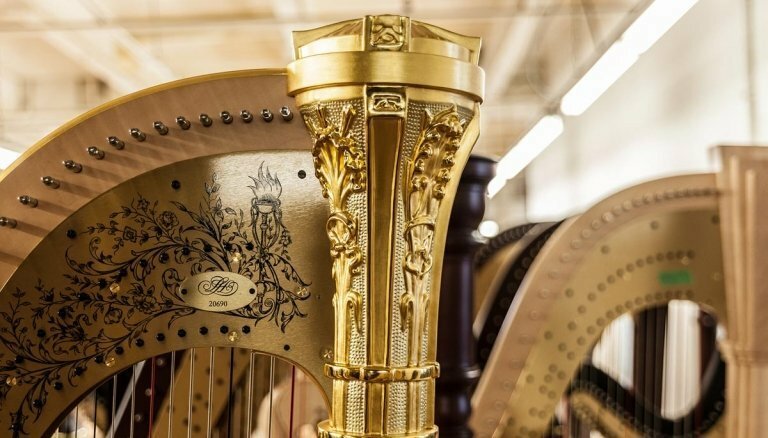 Harp owners have confidence in Lyon & Healy’s thorough knowledge of the craft and its craftspeople’s unique ability to reproduce any part of the harp. What was true in 1889 is true today: The name Lyon & Healy equates to superiority and ingenuity in harpmaking as defined by harpists worldwide. And, as the lineage of a Lyon & Healy harp passes hands from craftsperson to harpist, the entire staff has confidence and takes pride in knowing it will again be passed down through families for generations to come. As Lyon & Healy continues to uphold the finest principles in harpmaking for a second century, the company and its employees move forward, unyielding in their commitment to craft, value and service, and setting new standards along the way.